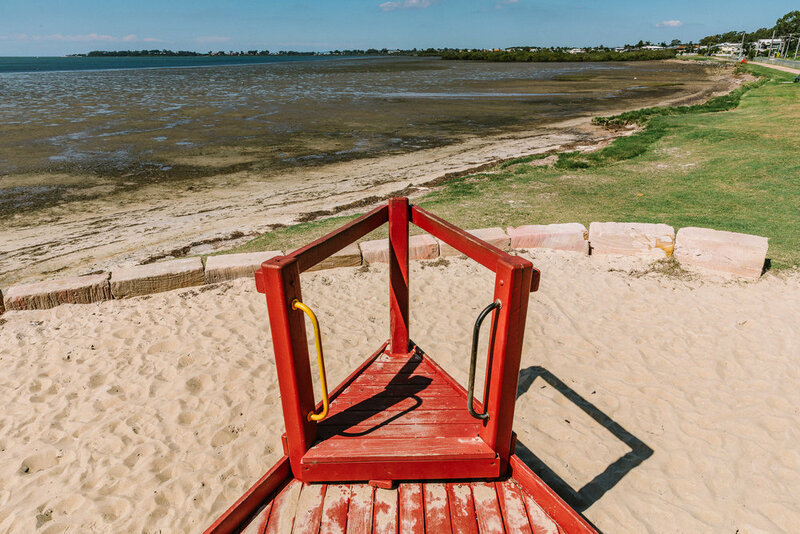 Situated a stones throw from Moreton Bay in this nautically inspired kids playground at Beth Boyd Park. This multi-level playground is about 65m from the main playground and features a twisty slide, several "gangways" and mock bow at the front of the structure. The pirate playground at Beth Boyd park is one of two main playgrounds located at this family friendly park in Thorneside, East Brisbane. The bow of the pirate ship playground is loads of fun for kids to use their imagination as they set sail on the seas of Moreton Bay. The toilet block is fairly basic and is showing it's age, but is nonetheless spacious and offers a good practical place to change nappies or outfits. Just across the road from the park and the kiddies swing are two awesome cafes. First there is the Unico Espresso cafe with some pretty awesome coffee and brunch food, and next door is the wonderful Raw Squeeze juice bar. That means you don't even need to prepare a picnic at Beth Boyd Park, just pop across the road and grab something on the day. 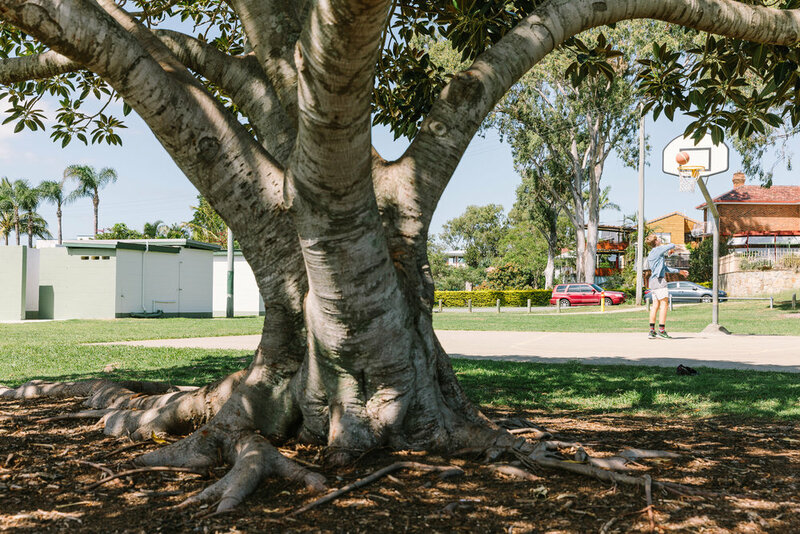 Every time I have visited the park there are always a few spare parks either down in the main car park on Mooroondu Road, or down the side on John Street. There is also plenty of close on-street parking making it easy to transport kids, prams and picnic hampers. A shaded BBQ is available at the park near the top and closely located to the picnic tables. Shaded picnic tables are located next to the bbq and right next to the main car park. While I am no botanist, these things look suspiciously like oak trees. They provide wonderful shade and cool micro climates and also appeal to kids for climbing and general mayhem. This outdoor gym seems to get more of a workout from kids than adults, but it is nice addition to the park and is shaded by the cool oak tree. Large open grass areas with oak trees to explore are a kids dream come true. Unlike the volleyball court at my school, this one seems to always be in good working condition and yet doesn't seem to get much use. Why not bring a beach ball, or any ball for that matter and take advantage of this wonderful location. 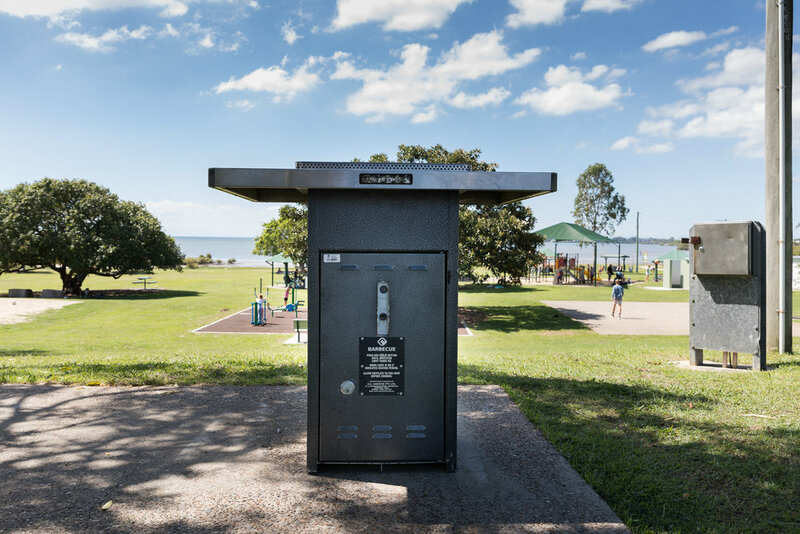 The park is part of the 150km Moreton Bay Cycleway which is the longest cycleway on the east cost of Australia. Okay so I am calling it a super slide. This tandem slide use the terrain of the hill to provide an impressive slide for kids of all ages. The main playground is pretty cool with a dual slide for racing down and bridge which my three year old is terrified of because she must have slipped over in the past. There are mechanical diggers to play with the sand and other cool things for kids to discover and keep them amused. A shade cloth covering is also a bonus as are the nearby picnic tables.